It’s Wednesday which means it’s new comic book day with new releases hitting shelves, both physical and digital, all across the world. This week we’ve got the longest con ever! The Long Con #1 is by Dylan Meconis, Ben Coleman, EA Denich, M. Victoria Robado, Aditya Bidikar, Leila Del Duca, Sara Richard, Keith Wood, Robin Herrera, and Ari Yarwood. The city is a dark place… as dark as new Darkpoop Cola, an exclusive Poop Cola flavor available for a limited time! When Gaz demands her brother get her some of the precious cola in the middle of the night, Dib enters a shadowy underground of Poop-driven factions warring for control of all Poop-kind. But why? Is there more to Poop than meets the eye? And is it all just too stupid for Dib to care about? Part one of a two-part story. The Sixth Gun #41 is a stand alone story of Drake and Becky’s relentless journey to obtain The Sixth Gun and the five others, but also necessary if we are to understand the history of The Six and from where their power originated. That story is the reveal of Griselda The Grey Witch’s past and what other twisted and dark secrets she holds. We have seen here many times before, but never really knew what her motives were. Why does she want The Six so bad? What does she plan on doing with them once she gets them in her grips? This issue of The Sixth Gun explains The Grey Witch’s history as well as her plans for the future once she gets her hands on all six guns and it only spells out doom and gloom for our heroes Drake and Becky. It’s difficult to pinpoint exactly what it is about The Sixth Gun that makes it so enjoyable. Is it the writing, the characters, or the art? It must be a harmonious combination of all three and Issue #41 delivers just like each chapter before it. The art in The Sixth Gun is always a standout part of each book and in this issue we are treated to the wonderful illustrations of Tyler Crook. If you remember from a few past issues, Crook aided Bunn’s co-creator and famed artist Brian Hurtt. Like Hurtt’s top-notch drawings, Tyler Crook’s illustrations take on a cinematic quality that jumps out of the page making you helpless to put it down. Add to this Bill Crabtree’s colors and sometimes I forget to turn the page because I’m staring at each drawing so intently. 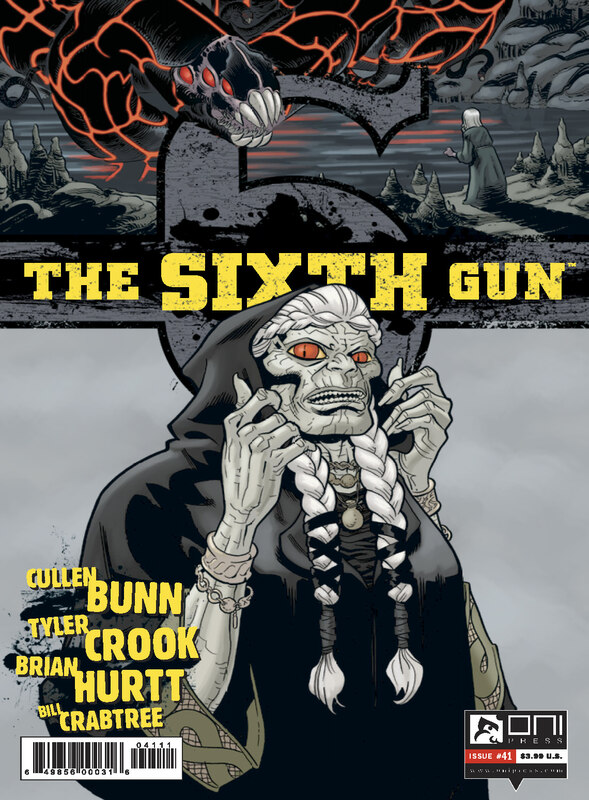 The Sixth Gun is the first comic I ever read by Cullen Bunn. I have picked up everything he has written since and he never disappoints. Issue #41 of the The Sixth Gun is a perfect example of how rich and intricate his storytelling can be and the main reason it’s one of the few comic books I read four or five times in a row. The history of the Grey Witch is something I never thought was necessary until now. Cullen Bunn delivers another amazing chapter of Drake and Becky’s adventures preparing us for the inevitable with tales from the very beginning. Learning of Griselda The Grey Witch and her history was the perfect story to tell that breathes more life into one of The Sixth Gun’s most feared villains. Someone asked me once to describe a comic book with one word. If I had to describe The Sixth Gun #41 using just one word it would be, FUN. All the elements I spoke about just now make this a really fun comic to read, re-read then read again. – Now that Jesup has all Six guns is their nothing in Griselda’s way to utilize their power? – Now we know that Griselda cannot physically hold any of the ‘Guns’. Will this affect how she uses them for nefarious purposes? – How will Drake and Becky get the ‘Guns’ back? – We know that The Grey Witch is General Oliander Hume’s mother and we probably will not see him ever again (maybe? ), but will we see The Great Wyrms again? I would love to see Drake and Becky fight them.